The Sweet Swap is an Australian food blogger event where those who registered for the event are required to make sweets to send off to 3 participants. In return, you would receive 3 packages of sweet treats on your doorstep from 3 other participants. This inaugural event is hosted by lovely ladies, Sara of Belly Rumbles and Amanda of Chew Town, with over 50 bloggers registering for this event. However, participants weren’t the only ones benefiting from this sweet ordeal. The cost to register for this event was donated to ChildFund Australia, providing a family in Uganda with banana shoots to grow. Once the exchange of treats was underway, it was a matter of eagerly waiting for my parcels of goodies. The buzz created on Instagram and Twitter did not help contain my excitement. Receiving the 3 parcels of goodies felt like Christmas. It was extremely exciting to receive sweet treats in the mail, knowing it was created with love by someone. After a while, I was getting use to this… Why can’t we have this on a more regular basis? The first parcel I had received was from Leah of Voracious Vander, who had sent me a generous package of dark chocolate and pretzel peanut butter cups. I’m not a big fan of Reese’s peanut butter cups because I find them too much for me but these were perfect, I loved the addition of pretzels to it. Absolutely AMAZING! Next up was coconut, currant and orange balls by Chanel of Cats Love Cooking. These perfectly shaped balls remind me of Ferrero Raffaello (minus the almond and wafer), the coconut aroma from these balls were intoxicating. Last but not least was a special sweet treat from Aga of A Matter of Taste. She made a Polish biscuit called Sloneczka, a recipe based on her grandma’s. They are sandwiched butter biscuits with a walnut vanilla filling, a layer of icing sugar topping baked on top of the biscuits and then coated in coconut. Perfect with a cup of tea. Chocolates and Confections: Formula, Theory and Technique for the artisan confectioner was my go-to cookbook that I had referred to during this ordeal. It’s a bible for making all things confectionery. The reason why I like it so much is because it explains the theory and science behind producing delectable treats. It’s not a cookbook for everyday home use though as the recipes typically yield 100-200 chocolates, but luckily enough, the ingredients for the recipes are listed by weight (and percentage), which makes down-scaling recipes so much easier. The decision on what to make was not easy. Making something that would survive the transportation process was the main deciding factor. The easy option would’ve been for me to make nougat as I’ve always wanted to learn how to make it. But knowing myself, I wanted to make something more challenging and create something special. So when I saw a recipe for chocolate-covered caramel nougat in the Chocolates and Confections cookbook, I just knew I had to put a twist on the Snickers bar as I love toying with the idea of putting a spin on old favourites. Not to blow my trumpet but I’m pretty chuffed about this creation. Rest assure that it wasn’t all smooth sailing though. I had followed the caramel recipe in the book but may have walked away from it slightly so there were clumps of caramel by the end if it; it wasn’t smooth at all. Initially, I thought the recipe was odd as it required evaporated milk, and I didn’t think to strain the evaporated milk before adding it, which may have contributed to the clumpy caramel. This mixture was binned. So I stuck to what I know when it comes to making caramel: use sugar, water, cream and butter; that is all. Never use evaporated milk for caramel. Ever. Then there’s tempering chocolate… The first time I did it, I fluked it; my thermometer wasn’t working so I tempered the chocolate by “feel” and nailed it. This time, because I was working with a larger batch of chocolates, I failed at trying to keep the melted chocolate at a constant temperature. The first half of the chocolates I coated were fine, I think I should’ve returned the chocolate to the heat and tempered it again. Here’s a good video from the author of the Chocolates and Confections cookbook showing you how to temper chocolate and check to see if your chocolate is tempered properly. Otherwise, David Lebovitz has provided useful tips for tempering chocolate as well as a method to temper chocolate without having the need to use a thermometer; essentially you melt the chocolates, coat whatever you want with the melted, untempered chocolate and then place them in the fridge. Definitely going to try this technique next time. Thanks Sara and Amanda for your hard work and efforts for organising this fun and delicious event. 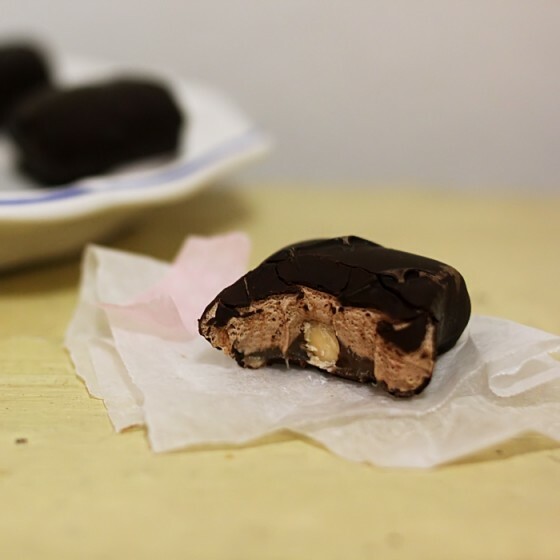 So without further ado, the recipe for my take on the Snickers bar à la chocolate almond. Also, be sure to check out the other lovely treats created by other Sweet Swappers. Bite-size treats with a twist on the classic Snickers bars. Line a 18 x 30 cm (6 x 12 inch) baking tin with baking paper. Dissolve glucose and sugar in a saucepan over medium-high heat until you get a little colouring in the sugar. Turn the heat to medium and carefully add cream to the sugar, in small batches to avoid having hot caramel splattering on you; stirring well after each addition. Stir the mixture until it reaches 110C (230F); add butter and salt and mix until caramel reaches 115C (239F). Quickly add the chopped almonds to the caramel, combine and pour onto the prepared tray. Set aside to cool completely. Place chocolate and cocoa butter in a metal bowl over a saucepan of boiling water and stir until melted. Turn off the heat and leave bowl over saucepan until required. Sift milk powder, cocoa powder and icing sugar in a small bowl and set aside. Combine egg whites and 20g glucose in a bowl of a stand mixer. Combine sugar, 270g glucose and water in a saucepan over medium-high heat and heat until 110C (230F); begin whipping egg whites/glucose mixture on high speed. [You'd want the egg whites to reach medium peaks (that is, a little more than soft peaks but no more than stiff) before you add the sugar otherwise your nougat will not be light in texture and deflated. So if you see the sugar mixture heating up quickly, turn it down until you start seeing medium peaks]. Once the sugar mixture reaches 118C (245F), add the hot syrup to the egg whites, pouring down the side of the bowl (not too fast that you dump it in because that would deflate the mixture and not too slow that the syrup cools down considerably); take care to not pour it onto the whisk because you'll get spun sugar. Mix for approximately 5-8 minutes until the mixture reaches 50C (122F). Add the vanilla and mix until combined. Add the melted chocolate mixture and then the dry ingredients by hand (you'll need a bit of elbow grease here). Pour on top of the almond caramel mixture, quickly spreading the mixture to cover the caramel. Place a sheet of baking paper over the nougat to flatten it out (using a small roller or a cylindrical jar helps!). Leave to cool at room temperature for about 30 minutes before placing in the fridge to cool completely. Take the caramel/nougat slice out of the fridge and using a hot knife (run under hot water and wiped dry); cut them roughly into 3 x 3 cm (1 x 1 inch) pieces. Melt dark chocolate in metal bowl over a saucepan of simmering water. Take off the heat and stir until the chocolate reaches 29C (84F), then place it over the saucepan of hot water with a kitchen towel over to maintain the temperate at 32C (89F). Cover the pieces in tempered chocolate and set aside on baking paper to set. Two versions of the Game of Thrones lemon cakes, both equally jam-packed with lemon goodness and perfect for tea in Winterfell (or wherever you may be). A trip to Port Douglas sees us dining at Harrison’s for a relaxing casual lunch focused on using regionally sourced and tropical ingredients. A new hip Asian restaurant and bar opens up in Canley Heights offering an array of delicious Vietnamese, Thai, Laotian, Malaysian and Chinese dishes. Soft caramels with a bit of a twist; apple cinnamon and toasted black sesame. Follow our adventure as we trek 18kms through Sapa. Share in the experiences and sightings that we witnessed in this beautiful region. Anthony and I are engaged. I get involved with making the dessert table and decorations for our engagement party. Smoky pulled pork tacos – Everything from scratch! Pulled pork. Is there anything it can’t do? Here I’ve had it with corn salsa, guacamole and red cabbage slaw for a wicked taco. Billy, Karen and I are hosting a 6 course dessert degustation for 60 people. Feel free to join in on the fun. Enter your email address for the latest updates delivered direct to your inbox!